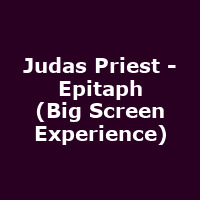 "Judas Priest, the heavy metal legends whose influence on generations of musicians and metalheads is incalculable, celebrate their 40th year as recording artists with a unique screening of their new concert film EPITAPH at London's Forum on 15th May. Presented in magnificent HD and stunning surround sound audio, it will be a full on concert event giving fans another chance to experience the last leg of the band's last world tour, filmed in London in 2012. The concert includes blazing live versions of at least one song from each of their 14 classic albums from 1974 to 2008."